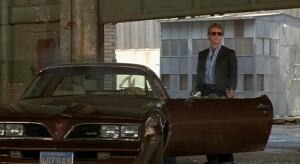 Ryan O'Neal is the man behind the wheel in Walter Hill's The Driver. Hard Times (1975) and The Driver (1978) are two of our favorite hard-hitting Seventies films by Walter Hill (The Long Riders). Hill’s second film, the action-filled crime drama The Driver, stars Ryan O’Neal (Barry Lyndon) as a professional guy-behind-the-wheel who steals cars to drive as getaway vehicles for big-time robberies in Los Angeles. Hot on the Driver’s trail is the Detective (Bruce Dern, Coming Home), a determined cop who’s willing to go to any length to bring him down. (Oh, all the characters in the film are referred to by their roles—The Driver, The Detective, and even a crafty woman known as The Player, portrayed by Ishtar’s Isabelle Adjani). The Detective becomes so obsessed that he sets up a bank job in order to entice, trap, and ultimately arrest, the Driver.